Genesis Framework and StudioPress Review: Good WP Themes for You? If you’re looking for a thorough Genesis Framework and StudioPress Review, you’re in the right place. Unfortunately, finding a theme that solves the problems you’re having may not be that simple. There are so many to choose from and all of them say they’re good at something. It can be confusing, I know–that’s why I’m writing this StudioPress review to help you decide if the Studiopress WordPress themes could work for you. If you decide at any point you want to skip the remainder of the review and TRY STUDIOPRESS OUT FOR YOURSELF, you can CLICK HERE TO SHOP AT STUDIOPRESS. 3 How Does StudioPress Work? 4 How Do I Get Started with StudioPress? 5 Who is StudioPress For? Eleven years ago, I left my job as a project manager at an architectural firm to pursue a career in freelance web design and internet shenanigans. They bootstrapped the business and drove it to become a very successful business, but they felt they hit a glass ceiling where they needed more financial resources to expand StudioPress and the Genesis framework, and after negotiation, they found the opportunity thru as a recent acquisition by WPEngine. Today, Brian works with the team at WP Engine to continue growing Studiopress, improving the Genesis framework, and building the development community. They’re most known for creating the Genesis framework which is an installation of code that enables sites to be built optimized for search engines, optimized for optimal loading speed, mobile responsive, and customizable with the installation of a child theme. Many notable marketing experts use the Genesis framework. In fact, 500,000+ sites are running on the Genesis framework! This theme was built with law offices and legal professionals in mind. The layout of the child theme makes it easy to customize it with the information a legal professional would need to get clients. TAKE A LOOK AT THE LIVE DEMO HERE. Breakthrough pro was built for marketing agencies and marketing professionals. Studiopress knows many marketing companies need to display similar data to their customers (custom to their agency), so they’ve built Breakthrough Pro to make that easy. There’s customizable layouts for your services, a portfolio, and more. TAKE A LOOK AT THE LIVE DEMO HERE. 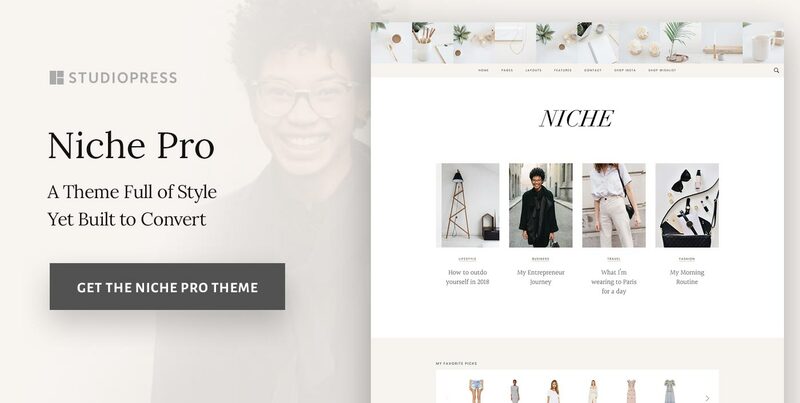 Niche Pro is a third-party theme that’s distributed by Studiopress, but was developed by Design by Bloom. The theme is designed for bloggers who want to leave from hobbyist and become professional. The theme is ideal for multiple niches because it is fairly neutral and customizable. TAKE A LOOK AT NICHE PRO LIVE DEMO HERE. Essence Pro is designed to be simple, and without alot of visual distractions. It’s made specifically for the health, wellness, and lifestyle niches, but can work for others. VIEW THE LIVE DEMO HERE. 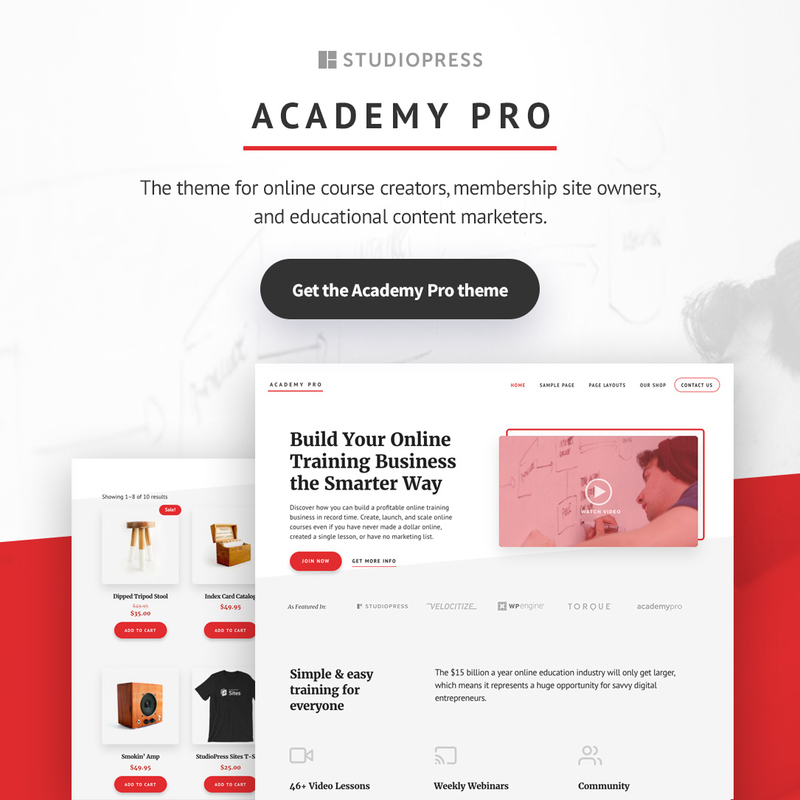 Academy Pro is a theme built for course creators and those who want to run a membership site. It is customizable to help course creators showcase their credibility, and display why others should buy courses from them. Since there are so many agencies and individuals who find the coding of the Genesis framework to improve the performance of their WordPress website, many people add the framework to their sites and create or customize the child theme. You can CHECK OUT SAMPLES OF SITES CUSTOMIZED FROM THE GENESIS FRAMEWORK. After you’ve set up your WordPress website, you’ll need to install a theme. If you use my #1 recommended hosting company, setting up the website takes less than one minute and included with the setup, you’ll get a free theme. Most people buy a premium theme from Studiopress because they want to optimize their sites for speed or better functionality. As a result, they would switch from a free theme to a Studiopress by purchasing a license for use. Once you have a license to use the Studiopress theme on your website, you can upload it and begin customizing your website. How Do I Get Started with StudioPress? 1. Set up your WordPress website. Every hosting company has a different way of setting up a website: some are more complicated than others. If you’re searching for a hosting company, I’ve written an article with best practices for how to choose a hosting company. It has a list of my top recommended website hosts. For my #1 top recommended hosting company, setting up a website is the simplest. In fact, you can set up a website in less than 5 minutes by following this tutorial here! After your website is set up, then it’s time to install your theme, so you can make your website look how you want. The theme is what enables you to customize your site. Studiopress has more than 35 themes to choose from and you can pick any one. Once you’ve selected and paid for your theme, you would have a ZIP file. You take the ZIP file, and log onto your WordPress website. StudioPress doesn’t offer many training options. When you purchase a theme, you’ll also recieve instruction guides that walk you thru the installation of the theme. While it’s simple to set up a theme (epecially if you’ve done it before), if you’re not very familiar with WordPress, you may feel the need to find videos, articles or training programs elsewhere. My #1 recommended training program will give you information on how to set up your website, how to optimize it for search engines and social media, and more. YOU CAN BEGIN INTERNET MARKETING TRAINING FOR FREE HERE. Studiopress is well known for the support they offer customers. Their themes stand on their own and don’t require alot of support, however, when you need support, they are accessible by thru MyStudioPress, a customer portal. 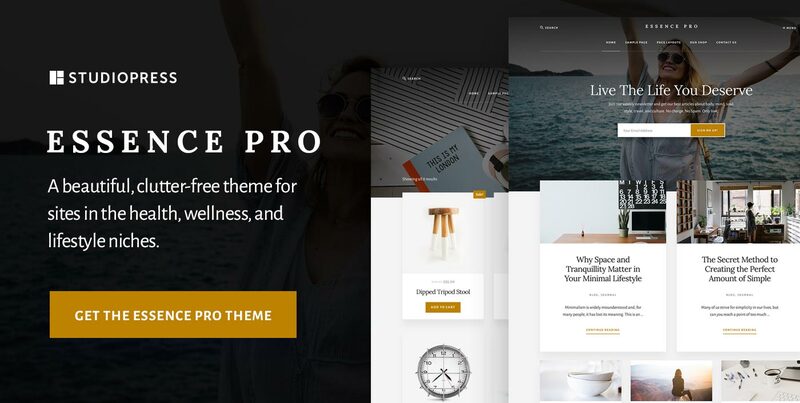 The WordPress themes from StudioPress are ideal for anyone who wants an extremely well-built, great-looking theme that they can easily install and have up and running on their site with as little fuss as possible. Solid, practical and low-maintenance, these are undoubtedly some of the best themes in the business, but, unless you’re a coder or are willing to pay for custom development work, for the most part, what you see is what you get! 1. You can buy the Geneis framework for 59.95. The framework would need customization by a coder or it would need a child theme installed on top of that. 2. The Genesis framework and child theme package is $99.95 for a single site license. 3. If you plan to use the themes for more than one site, you can buy the multi-site license for $499. 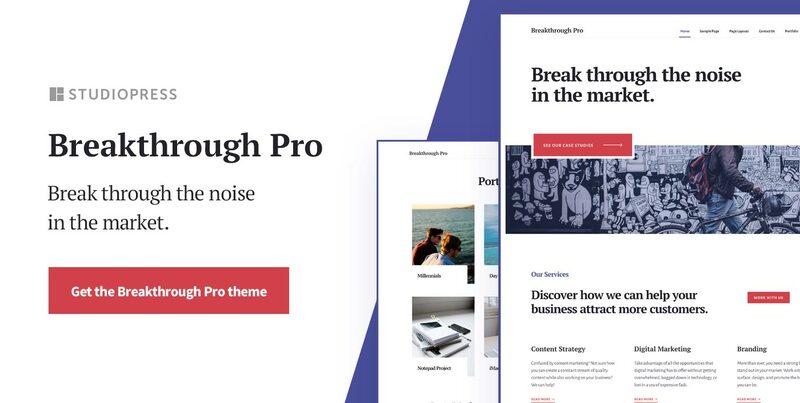 Overall, the Studiopress themes are very high-quality. So far, I have yet to find themes that compare to the speed you can get with the Genesis framework, and I’ve purchased several premium themes to try. You should definitely TAKE A LOOK AT STUDIOPRESS. While all of the features and bells and whistles may be nice, many other themes will show CSS errors, JQuery errors, and have other coding issues that interfere with your speed, security, and search engine optimization. SHOP THEMES AT STUDIOPRESS HERE. Elegant Themes – Elegant themes is the creator of the Divi theme and several other very popular WordPress themes. They create themes with lots of “bells and whistles” including animation and a front-end pagebuilder. LEARN MORE AT THE ELEGANT THEMES WEBSITE. Thrive Themes – Thrive Themes has created several themes and plugins for website conversions. They have themes, a front-end pagebuilder, and plugins that make it possible to create landing pages, optin form, pop-ups, countdown timers, quizzes, and much more. LEARN MORE AT THE THRIVE THEMES WEBSITE or read my full Thrive Themes review here. 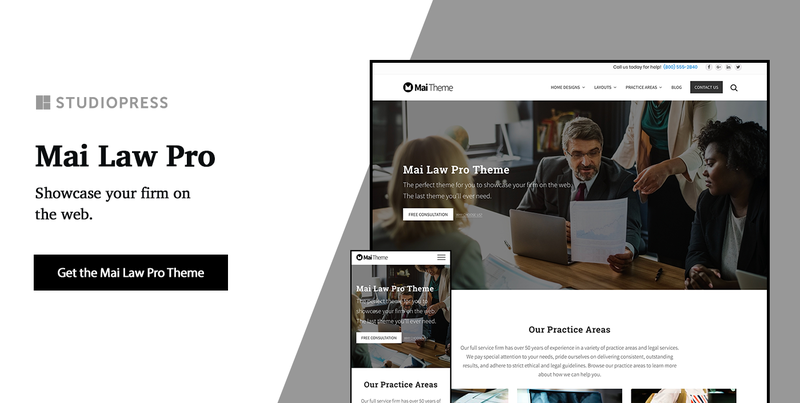 Themify Themes – Themify has a pagebuilder and several themes many people like. I personally tried them and thought they were quite complex, however, they look very nice and have many stylish features. TAKE A LOOK AT THEMIFY FOR YOURSELF HERE or read my full Themify review here. GeneratePress – This theme starts out free, then has premium features you can upgrade to. It’s highly acclaimed by many internet marketers as being “well coded”, built for speed and optimized for SEO similar to Studiopress, and it’s compatible with many pagebuilders. LEARN MORE AT THE GENERATEPRESS WEBSITE HERE. SHOP WORDPRESS THEMES AT STUDIOPRESS NOW! Thank you for this great article you must have put a whole lot of energy writing this and I really appreciate the effort, am a newbie blogger and I really like to come up with one of the nicest themes for my blog, thanks for providing great insights into what studiopress is all about. I think this will be the best theme for me. Thanks Clement for your compliment! I’m so glad you found the article helpful. If you decide to go with Studiopress, I’ve love to hear your thoughts afterwards! Loved reading your article Tiffany. I heard about Elegant Themes and Thrive Themes but I haven’t heard about Genesis Framework themes. I loved that they have quite the options depending on your interests and your blog main topic. This is very useful. I can see that they are also coded well and they load fast which is really important for anyone in blogging world. I will definitely check them out for my future projects. Hopefully, they can be helpful for you Strahinja. You sound like a freelancer or agency owner, so Studiopress themes might be a nice option to have on your list of possibilities for client work.